See how the gospel transforms and challenges the church in Corinth, and your church today. Even today, Jesus is still a figure of intense interest and admiration for millions. But then there’s His church. Church is a boring topic for most, and a reluctantly fulfilled duty for many. And we can understand why. Churches say they have the best news in the world, that they have the answer to our problems, that they are God’s embassies on earth; and yet churches are made up of people like you and me, who are grumpy, irritable, unfaithful, selfish, and worse. And as that is sadly true of churches today, so it was of the church in Corinth. It was young, it was full of life, and it was just as full of problems. What would God say to such a challenging church? What did they need to be excited by, to listen to, to learn? Use this seven-study guide to open up the first nine chapters of the letter of 1 Corinthians, to hear what God said to His church in Corinth, and what God still says to His church today. I work primarily with college students who lead Bible studies on an American University campus. For a long time we have wrestled to find a method of Bible study which both teaches how to study the Bible well and also helps guide and support discussion for people who are still learning. Dever does a great job using the text to teach while also providing helpful questions and observations to the users. Grateful for this series and this book. There are seven studies, and at least one can be divided into two. - Mark Dever does a very good job of taking us through some large chunks of text, without skipping anything, and yet without getting bogged down. - From the second study onwards there is a 'story so far'. It's a small thing but it reminds everyone that these studies are part of a whole. - As with previous study guides, there are leaders' notes at the back. One small thing I especially liked was that in the leaders' guide, the questions are repeated, instead of only giving the question number. We will be using this guide for our bible studies in the autumn - alongside the preaching. Mark Dever has been a leader of church reform for many years now, and nobody I know has thought more carefully about the church. 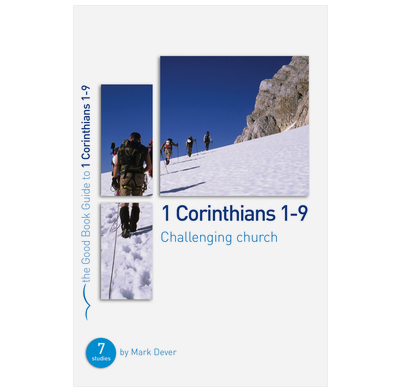 That’s why I’m thrilled the Good Book Company is publishing Mark’s helpful study guide to 1 Corinthians, because no book of the Bible says more about the church. No doubt, Mark has acquired these insights through many years of hard labor both in the Scriptures and in the church. Whether you are a church leader or a faithful member, this guide will help you understand and apply 1 Corinthians to your life and the life of your church. Unless you run a house group full of people who have never had problems I would avoid this book at all costs. If you have any women, divorcees, or people married to unbelievers be prepared to have people hurt as the book is written with a lack of sensitivity, indeed a harshness, which defies belief. It is not often as a house group leader I actually have to say to the group that we are going to have to stop using the book but this is the case in this instance. Very disappointed. Thank you for your feedback—and sorry that you found the Bible-study guide so unhelpful. As I edited this particular Good Book Guide, I thought it helpful that I respond on Mark Dever's behalf. I'm assuming that your unhappiness is with one particular study, number six, on 1 Corinthians 7. Mark did include a couple of notes in the leader's guide, explaining that "these are tricky and emotive issues" and suggesting that "it may be wise to talk to particular individuals before this study, so they know the topic is coming up". I am sorry that you felt the GBG was written with a lack of sensitivity and harshness—again, I assume you are referring to the leader's guide rather than the study guide (which simply asks questions) unfortunately space is at a premium, and so the Leader's Guide is aiming to help leaders to understand the Bible clearly (which I think this study does), and to flag up any pastorally sensitive issues (which this study also does) so that leaders can use their own sensitivity and gentleness to guide their group through challenging parts of Scripture. All our Good Book Guides are trialled by a house group before they were published. This one was used by a group who are certainly not "without problems", and which contained women and people married to non-Christians. While not at all wishing to suggest that your comment is unfounded with regard to your own group, I think it's right to mention that the trialling group found this study helpful; challenging, yes, and difficult to grapple with how God wanted them to live as His people; but faithful, clear, and not changing Scripture to make it more palatable. I hope that you and your group found the other six sessions useful and biblically faithful. Do please let me know if there are any parts of study six which you feltht were unbiblical, and if it were the case that the studies obscured or confused the clear teaching of 1 Corinthians, we would of course make changes in the reprint.